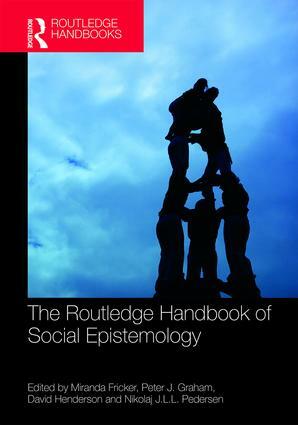 The Routledge Handbook of Social Epistemology is an authoritative and comprehensive survey of the most important issues and developments in one of the fastest growing areas of research in contemporary philosophy. An international team of scholars articulates the state of the art, draws out important connections, and breaks new ground in many areas of this intersciplinary new field. The Routledge Handbook of Social Epistemology is a major reference source for all students and scholars in epistemology, as well as researchers in philosophy of science, feminist philosophy, political philosophy, philosophy of language and in related fields like social and evolutionary psychology, political science, economics, and critical theory. Peter J. Graham is Professor of Philosophy & Linguistics at the University of California, Riverside, where he also served as Associate Dean for Arts and Humanities. He specializes in epistemology and related areas in the philosophies of psychology, biology and the social sciences. He is Associate Editor of the Journal of the American Philosophical Association and the Co-Editor of Epistemic Entitlement (2019). Nikolaj Jang Lee Linding Pedersen is Associate Professor of Philosophy at Underwood International College, Yonsei University and is the founding director of the Veritas Research Center, also at Yonsei University. He is co-editor of New Waves in Truth (2010), Truth and Pluralism: Current Debates (2013), Epistemic Pluralism (2017), and Epistemic Entitlement (2019). David Henderson is Robert R Chambers Distinguished Professor of Philosophy at the University of Nebraska, Lincoln. He teaches and writes primarily in epistemology and the philosophy of the social sciences. He is the coauthor with Terry Horgan of The Epistemological Spectrum: At the Interface of Cognitive Science and Conceptual Analysis (2011), and coeditor with John Greco of Epistemic Evaluation: Point and Purpose in Epistemology (2015). Miranda Fricker is Presidential Professor of Philosophy at The Graduate Center, City University of New York. Her research is primarily in ethics and social epistemology with a special interest in virtue and feminist perspectives. She is the author of Epistemic Injustice: Power and the Ethics of Knowing (2007); co-author of Reading Ethics: Selected Texts with Interactive Commentary (2009); and co-editor of a number of edited collections, the most recent of which is The Epistemic Life of Groups: Essays in the Epistemology of Collectives (2016). She is an Associate Editor of the Journal of the American Philosophical Association and a Fellow of the British Academy.